Sustainability factors should be considered by managers like any other business risk issue; these factors are expected to have a substantial impact on corporate management. Air transport corporations need a strong sustainability management framework to effectively manage economic, environmental and social risks to achieve their corporate sustainability objectives, and to meet their stakeholders’ demands. This book offers a new Enterprise Sustainability Risk Management (ESRM) model to fulfill these requirements. In the model presented, the triple bottom line (TBL) agenda is incorporated into the companies’ sustainability management. ESRM deals with the environmental, social, and ecological risks as well as the strategic, economic, operational, and threat risks of companies. The best corporate sustainability strategies and management approaches require the consideration of all corporate risks in both a holistic and systematic way. Flouris and Kucuk Yilmaz present an effective way to manage sustainability risks via a new, well-designed, integrated, dynamic and flexible framework. It introduces an opportunity for turning risks into potential corporate advantages. 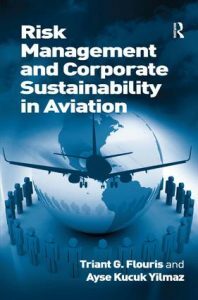 Risk Management and Corporate Sustainability in Aviation is addressed to professionals, students and researchers within air transportation business management and risk management.